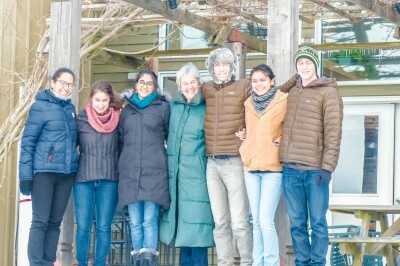 Students on a Middlebury College alternative spring break trip chose intentional community as their focus, dedicating their vacation to service learning at EcoVillage Ithaca and Sirius Community in Massachusetts. 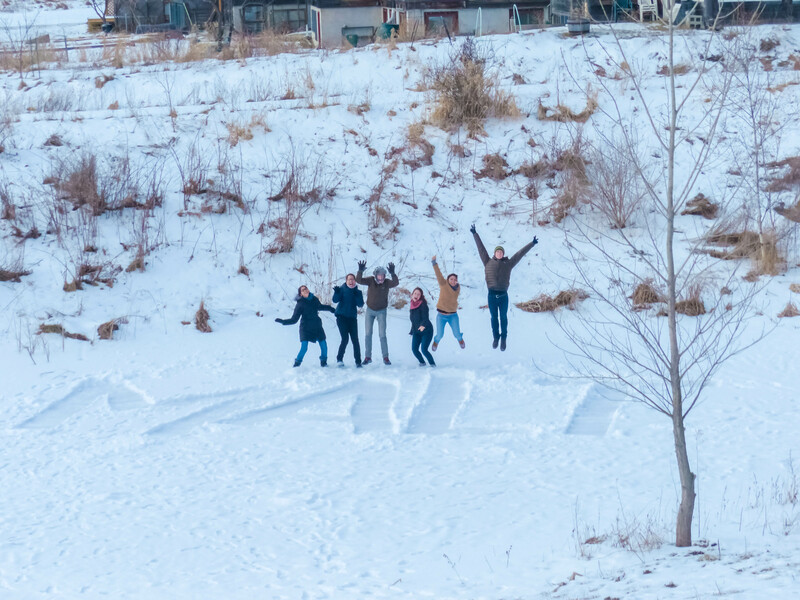 For three days and nights the visiting students were immersed in EcoVillage life. 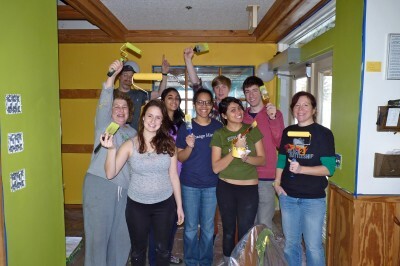 They contributed time and talent by painting, cooking, and helping with construction finish work alongside new residents in the TREE neighborhood. 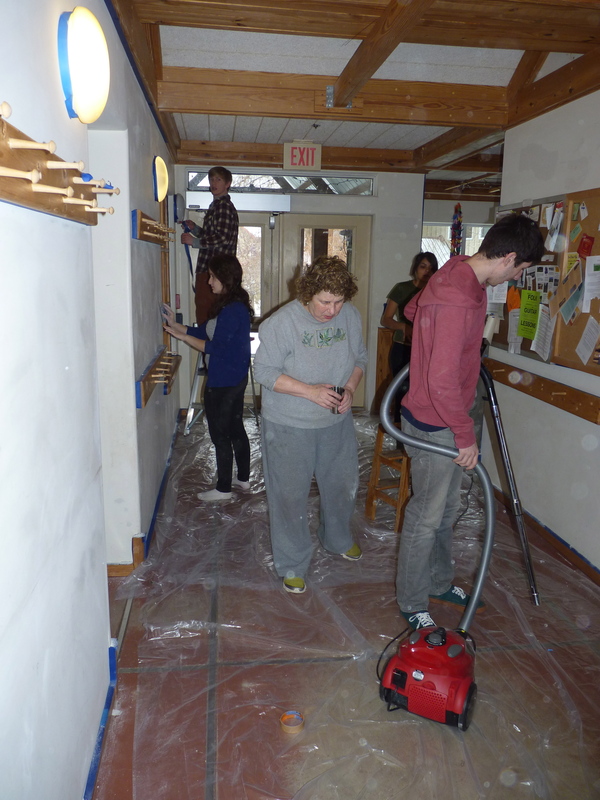 Trip co-leader and student Blake Harper said “painting the FROG common house hallway was a major highlight . . . we got to see how action is coordinated and carried forward. It was also a great bonding experience.” Villager Deena Burke helped to coordinate the project and remarked on how energetic, caring and fun the group was to work with. Their bright spirits are reflected in the cheerful new colors greeting everyone who walks into the common house. “Thank you so much for the wonderful experience of living in the EcoVillage! 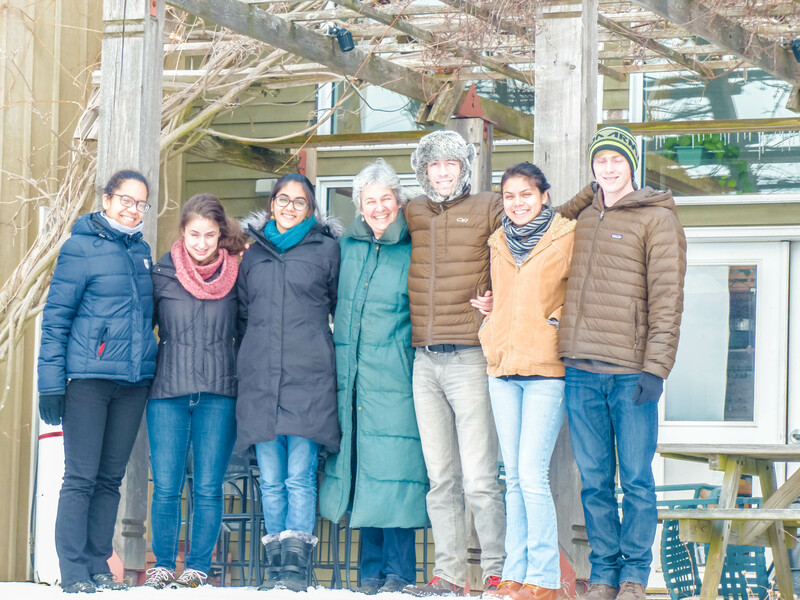 We couldn’t have been able to learn so many new things about ourselves, the world, and a warm community that the ecovillage is, without your stories,” enthused one of the students. Villagers shared their stories during a community dinner, a meet and greet circle, an overview tour, and a session on green building which included stops inside the FROG root cellar, a straw bale home in SONG, and passive houses in TREE. Tending one’s spirit while serving others was the focus of an interactive talk led by Monty Berman. As a founding member with 18 years of cohousing experience, he shared his perspective on contributing to community life through self awareness and service work that also feeds the soul. “What you have set up here is truly incredible, and we were blessed to be part of it, even just for 3 days. . . Enjoy what you have created and cherish it!” were parting words from trip co-leader Rod Abhari. 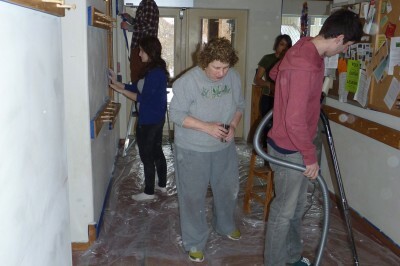 In response we say, EcoVillage Ithaca is blessed by your presence and your work, MAlt students. Come back and see us!